PLYMOUTH, MICHIGAN — The Chicago Steel erased a pair of two-goal leads by Team USA U18 Friday night at USA Hockey Arena, but could not find the late equalizer in a 5-4 loss. The Steel (24-13-1-0, 49 pts.) suffered their first loss since January 5 in the matchup against Team USA (16-13-2-3, 37 pts.). The loss snapped a seven-game win streak for the Steel. Right wing Josiah Slavin scored twice in the contest for Chicago. Team USA was led by a three-point night from forward Danny Weight (2-1-3). Team USA struck first, opening Friday’s scoring with a wrist shot goal from forward Michael Gildon just 3:27 into the game. Gildon one-timed the puck from off the boards over the right shoulder of Steel goaltender Reilly Herbst after a cross-rink pass attempt from USA defenseman Case McCarthy was broken up. Chicago tied the game 1:16 later when Slavin scored on the powerplay for his first of the game on a deflection off defenseman Jimmy Dowd’s shot-pass. Steel left wing Robert Mastrosimone started the play as he sent a cross-ice pass to Dowd who immediately found Slavin’s stick in the slot for the deflection past USA goaltender Cameron Rowe. With the assist, Mastrosimone extended his point streak to six games (3-4-7). Team USA took its lead back just more than midway through the first period when forward Judd Caufield tipped a shot past the glove of Herbst. The second USA goal came at the end of sustained pressure in the Steel zone as Caufield got his first goal of the year as he screened Herbst and tipped home a shot from defenseman Domenick Fensore. The teams traded scoring chances early in the second. Herbst stopped Team USA leading scorer Trevor Zegras as the forward skated in on a breakaway but Herbst pushed the chance aside as he slid to block the backhanded shot. Rowe then maintained the USA lead when he stopped right wing Josh Groll on a tap-in chance with a sliding stop. Team USA capitalized on the save from Rowe as they extended their lead to 3-1 less than a minute later as Weight scored his fifth goal of the season. Caufield fed a cross-crease pass to Weight who tapped home his first of the night past a sliding Herbst. 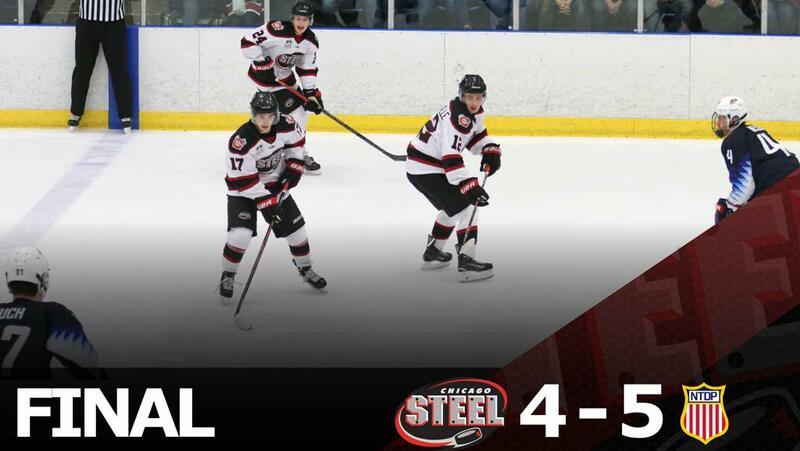 But again, the Steel answered back quickly, this time with a goal just 37 seconds later as right wing Neil Shea scored in his first game back after missing the last five games due to injury. Mastrosimone started the play as he was checked off a breakaway chance but fed Shea all alone in the slot for the one-time shot past the glove of Rowe. Weight was credited with his second goal of the period at the 12:13 mark as he sent the puck towards the front of the net where it careened off a Steel skate and past an unsuspecting Herbst. The Steel cut the USA lead to 4-3 with 3:31 to play in the second period when left wing Gunnarwolfe Fontaine punched home his 12th goal of the season. Steel center Jake Schmaltz won an offensive zone faceoff back to defenseman Ville Rasanen who skated the blue line before sending in a wrist shot on Rowe that Fontaine punched home from the glove side of Spencer Kinght, who had entered the game in place of Rowe. The goal pushed Fontaine’s current point streak to six games (4-2-6). Slavin picked up his second goal of the night, and third in as many games, just 67 seconds into the third period as he collected a loose puck in the slot, toe dragged and slipped a backhand shot past Knight to tie the game 4-4. Team USA scored the game-winner with under 12 minutes to play when Alex Vlasic jammed home a net-front chance. The play was started as forward Matthew Boldy sent a lob pass towards the slot that rattled around before Vlasic tapped it home. Chicago took its timeout to draw up the potential game-tying goal with 1:44 to play in the game and Herbst pulled for the extra attacker, but could never find the equalizer. Herbst made 26 saves in the game, including seven in the third period. The Steel and Team USA U18 will meet for a second and final time in the regular season on Saturday, Feb. 16 for a 7:05 p.m. puck drop at Fox Valley Ice Arena. The Steel return to Fox Valley Ice Arena on Saturday night for Chicago Blackhawks Night when they take on the Youngstown Phantoms at 7:05 p.m. Fans are invited to celebrate all things Chicago Blackhawks with a special guest appearance from Stanley Cup Champion Brandon Bollig and mascot Tommy Hawk. Tickets are still available.